QUARTERLY PROGRESS REPORT FOR QUARTER ENDING JUNE’2018. 1. Name of the Company/Firm/Society/Person: STABNET SUGAR REFINERY LTD.
2. 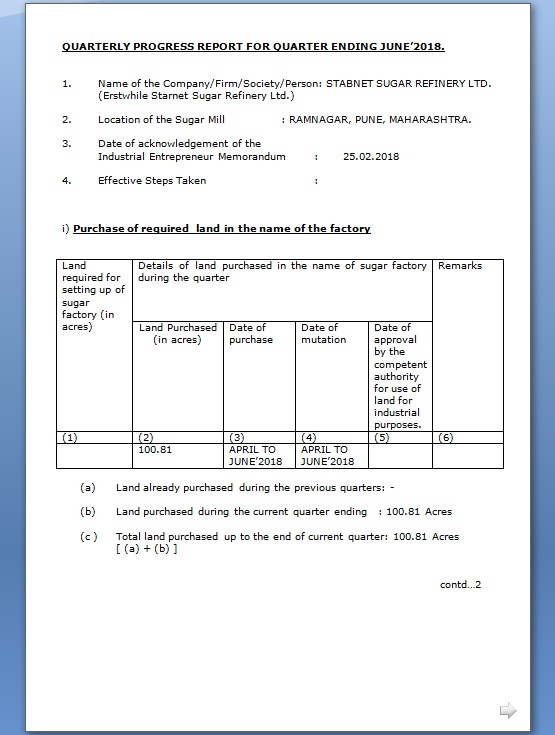 Location of the Sugar Mill : RAMNAGAR, PUNE, MAHARASHTRA. Date of approval by the competent authority for use of land for industrial purposes. * Please furnish a copy of the agreement made with the plant and machinery supplier(s). Date of completion/likely date of completion. * Please furnish a copy of the agreement made with the contractor(s). Name of the banks/financial institutions.